OMG, it is so beautiful here and we are having SO much fun. I am determined to keep my eating in check and just focus on the beauty of this amazing country, though I have to admit that today was wonkalicious. (By that I mean wonky, but in a good way, because I just went with the flow.) We were in transit FOREVER because the flight was delayed three hours and then the baggage handlers in Italy decided to go on STRIKE, but we finally made it here by 6 pm. Suffice it to say, I had no calories until 6 pm and then had a huge dinner. I am proud of myself, though, because I have been having vegetables and I also had 1/3 of my dessert with dinner (my favorite dessert, I might add) and gave the rest to hubby. I'm hopeful I have the energy to get up and run the streets of Venice. (Not the canals, mind you - steering clear of those.) I don't actually see anyone else running, so I'm a little worried they will look at me like I have three heads, but I'm going to give it a try, anyway. There is a fitness center, too. If I'm really shy, maybe I'll just give that a go. We have to make sure to get lots of spring water, because that's actually where I find myself struggling the most. But this is really a once-in-a-lifetime vacation. My mom was gracious enough to take the kids, so hubby and I are truly on our own, enjoying this amazing experience together. (He's crashed out in the room right now, and I'm just trying to hold on long enough to call the girls.) Tomorrow, we will take a walking tour of Venice and go on a gondola ride. Romantic, yes!!! (I'd better not come back preggo. BWAHAHA!) Note from Me, 4.5 months later and 4 months pregnant: "Ha, bloody ha." Anyway, hope you're all doing well. Talk to you soon! Don't get me wrong. I like peanut butter as much as the next person. Hell, that's a lie. I probably like peanut butter a whole lot MORE than the next person. Like my latest favorite, Peanut Butter & Co.'s White Chocolate Wonderful. But I know what it is, and I know what it isn't. Today, I was on the elliptical reading one of the magazines they provide and there was an interesting interview with Kathy Griffin where she talked about how, as a stand up comic, she finally realized that she didn't have to be as obsessive about how she looks (as she might if she were an A-list actress or a model, or something, I guess). But then, she said that she swears by peanut butter as her primary protein source, that she even keeps a jar of it with her on the road. Now in the past, I would have taken this advice and run with it. Not just because I used to blindly take whatever I read as gospel, but mostly because I love peanut butter and would love to be able to give myself permission to eat it by the jarful. The truth is, I know better. While peanut butter has some protein, it is more accurately a FAT source than a PROTEIN source. Two tablespoons of regular peanut butter has 190 calories and a whopping SIXTEEN grams of fat, and only 8 grams of protein. That is by no means the same as other lean sources of protein: a cup of egg whites has 80 calories, SEVENTEEN grams of protein and no fat. Two ounces of chicken breast also has 17 grams of protein, but only 110 calories and 4 grams of fat. Don't get me wrong. Peanut butter has a place in my life. I luuuurv it. I have learned to have a teaspoon of it, which has negligible protein but also fairly low calories. I have also learned to relegate it to the fat category so I don't get overconfident about adding it to my meal plan. When I'm calling it protein in my head, I can justify eating a tablespoon of it (or two or three) right out of the jar as I rush out the door to grab my kids off the bus. Just like that, I've consumed an extra 200+ calories and close to 20 grams of fat. SO not worth it. Skinny as she is, I'm imagining Kathy's not doing that. She's probably much more careful about how she doles out the creamy good stuff. She also is probably working crazy hours and having no problem keeping her calories under control. I, on the other hand, need to really keep it in its proper place. Everyone I ran with was faster than me, but that just makes my competitive spirit kick in. I am DETERMINED to lose the last of this weight, keep training with people faster than me and truly get my 10-minute pace when we run the half-marathon in September. I'm going to register for it today and go online to find my favorite sneakers. I haven't gotten a new pair since before the 2009 Broad Street Run, so needless to say my dogs were BARKING during today's run. I'm doing so super great, and was happy to see that I was down a pound this morning despite the fact that it's the weekend. Today is going well so far. I thoroughly enjoyed my post-run meal (thanks, in part, to the fact that my Scavenger of a three-year old was down for a nap when we got home, thank you dear Erica the Sitter). So, I have to say, I'm surprised there wasn't more backlash from yesterday's post on counting calories. Either that means you all agree with me, or no one reads me. :) Either way, I'm a believer. Down 2 pounds this week and feeling stronger and leaner than ever. 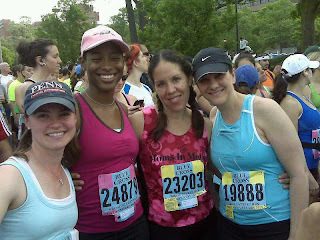 Tomorrow is my annual ten-mile run, the Philadelphia Broad Street Run. I'm running with my hubby for the first time and also encouraged by recent training runs that suggest I might actually beat last year's pace of 10:45 min per mile. One thing that has always been a bit of a challenge for me, as most of you distance runners know, is the insatiable hunger that comes with a run longer than 6 miles. So tonight, I have developed a 1700 calories food plan for tomorrow that allows for a satisfying pre-run meal and a generous post-run breakfast. I'll keep you guys posted, but I think I will actually reach my goal of 165 before we go to Italy, and under 160 by the first day of Summer. We go to a beach house for the last two weeks of summer, and I fully intend to be at goal (150) by the time we get there. I know, I know...I've said that before. But this time, I have a plan of how to get there and it seems to be working! !